"Sampath Speaking" - the thoughts of an Insurer from Thiruvallikkeni: Novaya Zemlya in Russia invaded by Polar bears !! Polar bears are attractive animals in white; No other animal symbolises global warming like the white polar bear. - though thought to be so, they are not so !! - their fur is translucent, and only appears white because it reflects visible light. Beneath all that thick fur, their skin is jet black. Polar bears have a very strong sense of smell, which they use to find seal breathing holes in the ice. Once it has found the hole, the bear will wait patiently until the seal comes up for air to attack. They can even detect a seal in the water beneath a metre of compacted snow. Over the past three decades, we have grown used to images of malnourished or solitary animals cast adrift on broken ice. Novaya Zemlya (lit. the new land in Russian), also known as Nova Zembla, is an archipelago in the Arctic Ocean in northern Russia and the extreme northeast of Europe, the easternmost point of Europe. West of Novaya Zemlya is the Barents Sea, and to the east is the Kara Sea. Russian officials have declared a state of emergency in parts of the Novaya Zemlya archipelago after what has been described as a “mass invasion in the islands' human settlements. Authorities on February 9 said incidents have been reported in Novaya Zemlya towns of bears attacking people and entering residential and government buildings, yes it an invasion of Polar bears that has made people scary, afraid of leaving their houses, their daily activities disrupted.. .. children not allowed to go to school - the reports suggest that the influx of bears is being caused by the seasonal migration of animals and the availability of edible wastes in the island settlements… ..do you know – the colour and eating habits of Polar bears of Antarctica ? To state the obvious: polar bears should not be wandering into human habitation, and certainly not in these numbers. That they are doing so in Belushya Guba shows how they are being driven off their normal migration routes and hunting trails by a changing climate. This has long been predicted – with the Arctic heating twice as fast as the rest of the planet, winter temperatures are rising and the sea ice – which is the primary habitat of polar bears – is shrinking. 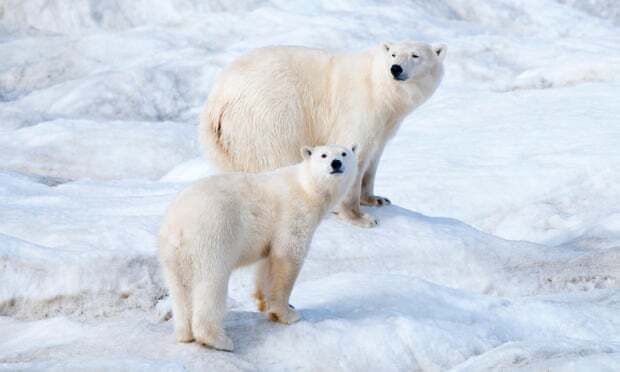 The polar bear (Ursus maritimus) is a hypercarnivorous bear whose native range lies largely within the Arctic Circle, encompassing the Arctic Ocean, its surrounding seas and surrounding land masses. It is a large bear, with the adult male weighing around 350–700 kg, while a sow (adult female) is about half that size. Although most polar bears are born on land, they spend most of their time on the sea ice. Their scientific name means "maritime bear" and derives from this fact. Polar bears hunt their preferred food of seals from the edge of sea ice, often living off fat reserves when no sea ice is present. Because of their dependence on the sea ice, polar bears are classified as marine mammals. Because of expected habitat loss caused by climate change, the polar bear is classified as a vulnerable species. The good news is that Russia has vowed not to shoot dozens of polar bears terrorising an Arctic town amid fears a plan to relocate the predators will end in disaster. Officials are preparing an urgent operation to sedate and remove the 52 bears after they invaded Belushya Guba on Russia's Novaya Zemlya archipelago and started 'chasing' frightened locals. The beasts will be transported a long distance away from the town - but critics of the scheme warn they could rapidly come back. 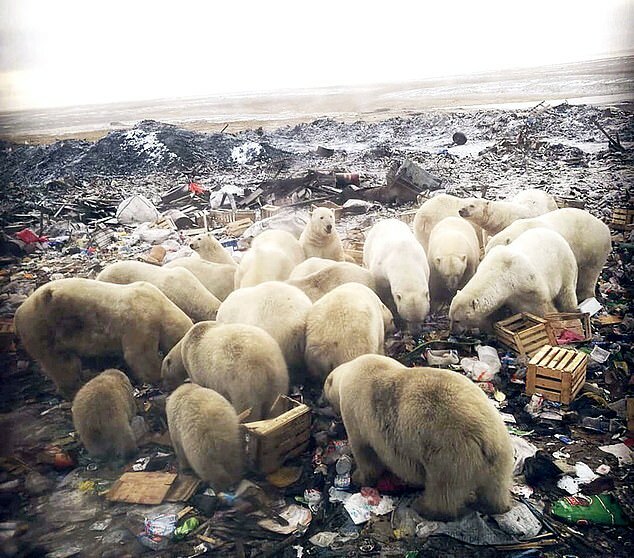 Extraordinary pictures and video show how people are living in fear in the settlement with polar bears stalking apartment blocks and scavenging at dumps. The head of the local settlement said that Russia's nature conservancy agency Rosprirodnadzor - which bans slaughtering the endangered wild animals - is sending a team to the remote islands to sedate and move the animals. It is stated that a state of emergency in the settlements for an unlimited time, has been announced and Rosprirodnadzor has been asked to provide people who will catch the bears, sedate them, and take them out of settlement without shooting them. A WWF expert in Russia blamed the country's defence ministry - which controls the territory around the settlement - for failing to act sooner ~ he further forecast the plan to move the bears would end in disaster. He said, 'There are many more polar bears on shores because of lengthy absence of ice. 'They come to the shore, attracted by human settlements which they specially like when the rubbish disposal system is not set up properly.' As it would be too difficult to remove all 50 bears, some pack of leaders or the most daring bears could be identified and taken away. Alexey Kokorin, head of the WWF climate programme, said: 'These are males, because females and cubs are hibernating. 'But in fact both males and females see humans for just one thing - food. 'Once they see these strange-looking two-legged seals, they know 'Ok, this is food'.' According to reports, the animals are 'literally chasing people and even entering the entrances of residential buildings'. Russian laws forbid the slaughter of polar bears except in specific cases where they attack humans. The besieged town is five miles from a Russian military base. Some experts say climate change is to blame for the bears behaviour - because the ocean is no longer frozen. If you remember the Q at the beginning on the colour of Polar bear at Antarctica, - googly, as there is no Polar bears in Antarctica (South Pole) – you get to see only Penguins.